“A wise man climbs Fuji once, but only a fool does it twice.” If this saying holds true, I am a super fool as I did it thrice. That aside, it’s July – Mt. 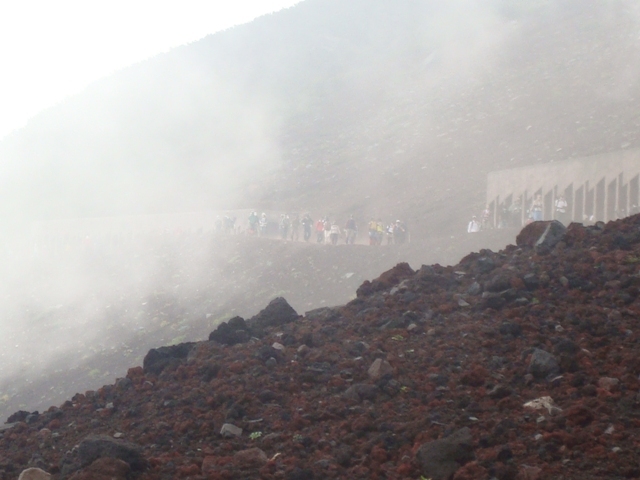 Fuji’s trekking season has come. – So let me share some tips and my experiences. My first trial was more than 10 years ago. Although it wasn’t registered as the World Heritage that time, Mt. Fuji was already crowded. There are 4 main routes, namely Yoshida, Fujinomiya, Subashiri and Gotenba. So far, I chose Yoshida route every time, as I bought the bus tour which included transportation between Shinjuku and the Yoshida route 5th Station. Instead of multi-day trekking, but I climbed it through the night. 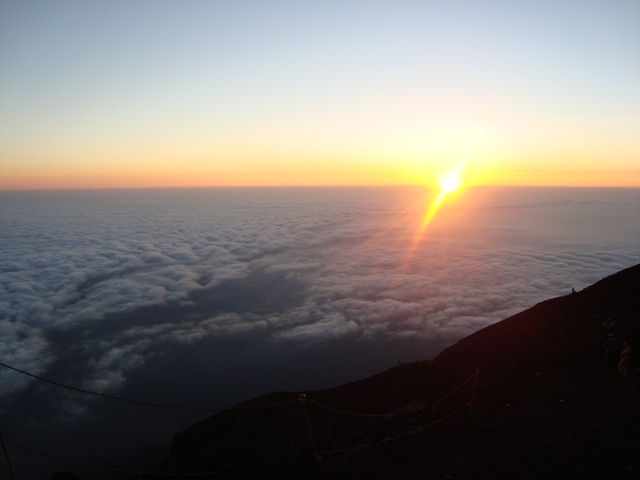 This night trekking is recently called ‘dangan tozan’ (literally bullet climbing, meaning climbing in a very short time). In my case, I used to start around 10:00 PM and returned back around 13:00 PM on the following day. I chose this style of trekking mainly because I didn’t want to stay overnight at mountain huts. From last year, however, Yamanashi and Shizuoka prefectures are requesting Japan Tourism Agency to ask the tourists to refrain from doing this style of trekking, concerning that it will increase the risk of injury and altitude sickness. Reflecting this movement, the number of buses arriving at night is decreasing. Clothes: Trekking jacket, fleece jacket, leggings, long-sleeve shirt, t-shirts, spare socks, spare underwear, rain wear. We prefered changing our clothes after trekking as we sweated a lot. Head light: Necessary if you trek during the night. Water: We brought plenty of tap water in a foldable water bottle. Water is extremely expensive on Mt. Fuji! Hat and sun glasses: It’s hard to get out of the sun on Mt. Fuji. Gloves: Useful when climbing the rocky road. Trekking poles: For the first and second trials, I didn’t use them. But when I tried using them at the third trial, I found it really helpful. Portable hot pack: Above Hon 8th Station, it’s extremely cold! Portable Stove: To boil water for coffee and noodles. Coffee: For us, it was mandatory to refresh! Cup Noodles: It’s not romantic at all, but cup noodles taste tasted awesome when we wanted to warm ourselves. A sense of achievement: Feeling really great when we did it. Bond with companions: It surely gets stronger after trekking. Fantastic view: It is mysterious to see the clouds under us. At night, the sky was full of stars. Lots of shooting stars in 360 degree view. It was like a planetarium in nature! Going downhill is just boring and awful. You can find the most updated general info from the below link.